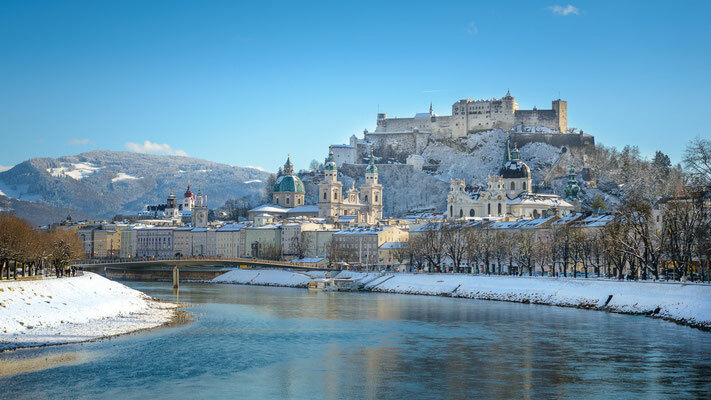 I had an interesting request from a reader recently who wants to spend Christmas in Salzburg with her family of 18. Of course many are attracted by the Salzburg Christmas market and want to spend their Christmas holidays in Salzburg. I shared a few hotels and places to rent where they could spend Christmas eve and thought this could be of use to you as well. Note that they do not have swimming pools. Located right in the middle of the city centre – around ten minutes from the old town and the famous Getreidegasse. There are a total of five pleasantly apartments so you can choose which ones you book and you’ll be able to have all 18 people in the same building. The same owners have this other building with again 5 apartments stylishly designed. They are in a fully restored 1920s villa in the Maxglan/Riedenburg area. A very central guesthouse which is in an old building but inside is decorated with minimalism modernism yet maintains warmth. There are also 3 restaurants downstair to try! Not sure if that would work for a silent night but handy nonetheless. At the foot of the fortress mountain, the property forms a unique ensemble for the old town of Salzburg. Five minutes walk to the Festspielhaus. A unique atmosphere with a combination of luxury pieces and craft masterpieces. A different style, more modern, young and playful but a boutique hotel in spirit anyway. They have an in-house restaurant and the breakfast looks quite special! Now, if you don’t want to spend your Christmas holidays in Salzburg, I have some good suggestions for Christmas hotels in the UK too! And of course all of these places would be good for the New Year.